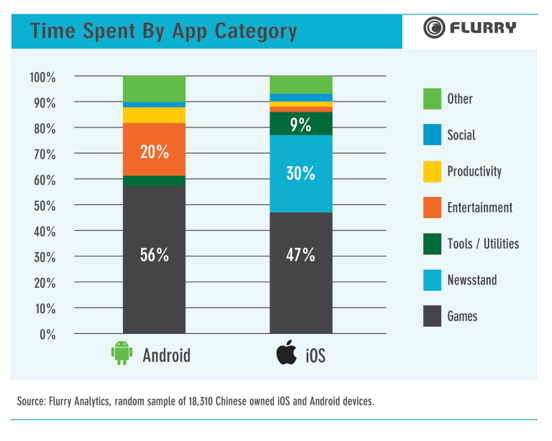 Gaming is by far the biggest app activity in China today. On Android, some 56% of users’ time is spent in gaming apps, compared to 47% on iOS. Both are fairly far ahead of the next-most popular categories on each platform. There, the numbers begin to diverge and point to how each platform appears to be aimed at different platforms, with entertainment the next biggest on Android (20%) and Newsstand at 30% on iOS — no small part due to the Newsstand being a very popular destination on iPad tablets. With Apple’s earnings out today, it will be interesting to see if iPad usage or Newsstand performance specifically come up in Cook’s regular remarks on how China is performing. For now, it looks like gaming is proportionately more interesting to Chinese consumers compared to those in the U.S. Figures from April 2013 found that consumers here only spent about 32% of app time in gaming apps, with 18% on Facebook. That still made gaming the most popular category, but far less so. Telling that social networking is only grabbing a couple of percentage points on time on either platform, too small to even get a breakout number in Flurry’s graphic. Yes, it’s an Apple/Samsung race right now, but eyes out for Xaomi. Last week Xiaomi, the Chinese Android handset maker whose flagship device is likened to the iPhone in terms of form factor, reported over $2 billion in revenue for the first half of the year, passing its total revenues for all of 2012. Flurry provides some numbers that is showing how this is playing out in terms of handset penetration. It is at 6%, the only other brand big enough to be worth breaking out after the big two. Interesting to note that while Samsung is clearly the biggest Android device maker, in terms of the installed base, there are significantly more Apple devices than Samsung devices in circulation, even if overall Android is far bigger, at 65% to Apple’s 35%. 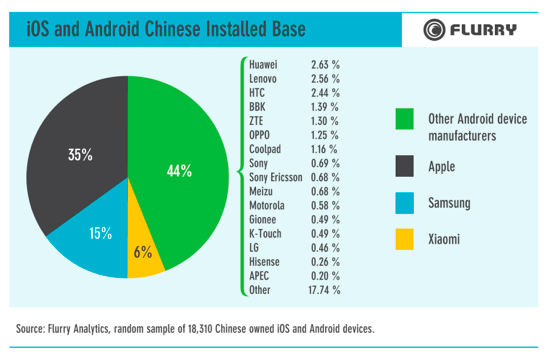 Again, tablets are proving to be a significant engine for growth or iOS in China in terms of device penetration. Flurry notes that some 21% of all iOS devices were iPad tablets, compared to only 4% of Android devices; Xiaomi is reportedly eyeing up releasing its first tablet, as well as extending outside of the Chinese market.